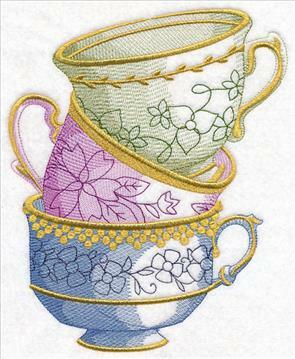 Add timeless elegance and grace to your home with these machine embroidery designs! 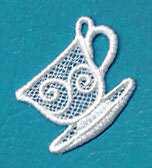 Vintage charm can be found in each and every motif, from gold-dipped teacups to miniature lace designs. 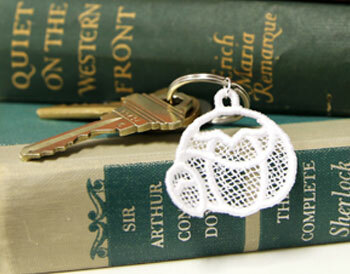 Light and lovely baby animals evoke the look of antique linens, while intricate doilies add classic style to any home. 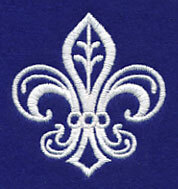 Stitch French-inspired medallions on pillows and totes. Plus, delicate wreaths, antique accessories, and more. a stack of beautiful teacups. Beautiful metallic gold thread, light shading, and intricate detailing give these antique motifs stunning style. 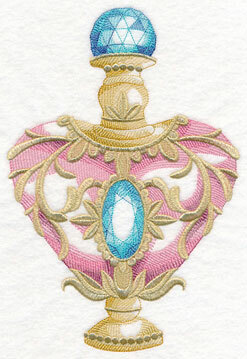 Add the teacup stack to kitchen linens; an ornate perfume bottle is perfect for the powder room. 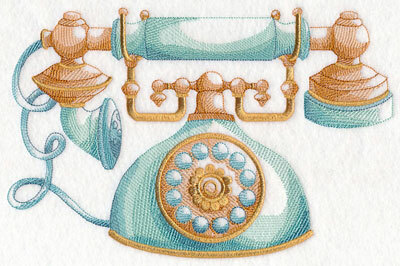 6.89" x 8.46" and 6.35" x 7.80"
6.86" x 10.12" and 5.86" x 8.64"
5.30" x 7.81" and 4.65" x 6.86"
An old-fashioned telephone finishes off this trio of boutique designs. 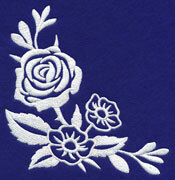 Great for embroidering on pillows, wall hangings, and more. 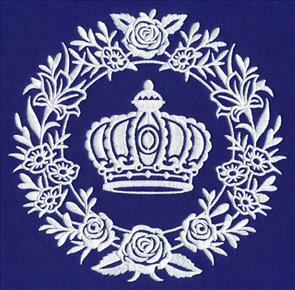 10.55" x 6.89" and 8.97" x 5.86" and 7.78" x 5.08" and 6.85" x 4.48"
Add sophisticated style to your embroidery with French-inspired whitework! 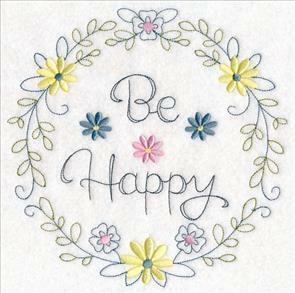 Each design is stitched using 30 weight thread to add gorgeous texture and style. 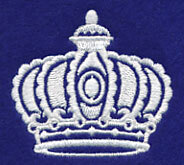 7.81" x 7.69" and 6.97" x 6.86"
The use of 30 weight cotton thread adds a raised, thicker appearance to this embroidery. 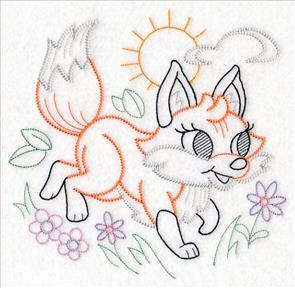 Use it for a unique style on your projects, or you can embroider using classic 40 weight rayon thread, too. 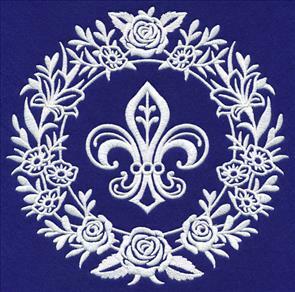 Beautiful flowers and classic French symbols (the Napoleonic bee, fleur de lis, and a crown) give these medallions chic, stylish appeal. 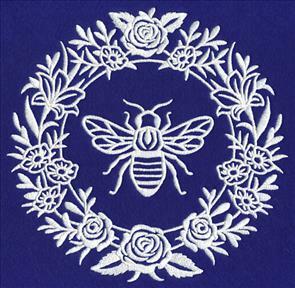 In addition to the whitework wreaths, a coordinating separation has also been created. 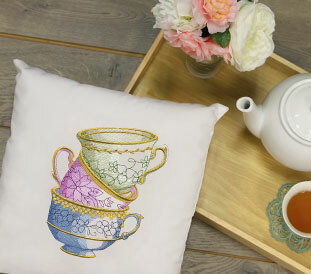 Use together to create table or bed linens, a tasteful quilt, or bath decor! A floral border and matching corner are a stunning way to finish off the French Boutique designs -- the perfect fit for any project! 11.74" x 3.93" and 9.41" x 3.15"
5.85" x 5.86" and 4.85" x 4.85" 3.85" x 3.86"
Adorn your next project with these intricate, yet quick-stitching designs. Get them all in a design pack! Nursery gear, floursack towels, and baby shower gifts will get an adorable update thanks to these vintage-style woodland animals. 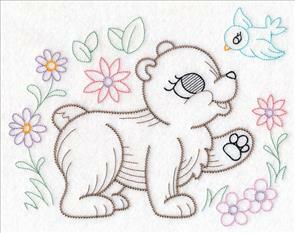 Inspired by antique linens, the sweet, yet playful pals will stun on baby quilts, onesies, burp cloths, and more. 7.15" x 7.76" and 6.23" x 6.75"
5.41" x 5.85" and 4.90" x 5.30"
7.05" x 7.85" and 6.14" x 6.83"
5.58" x 6.22" and 4.85" x 5.41"
Wrap your favorite little one in this too-cute onesie for a burst of sweet style. 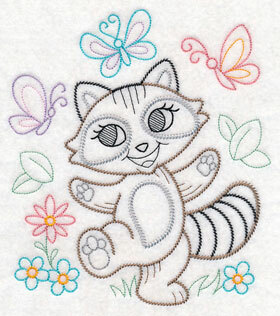 New to stitching on baby gear? Find our tutorial (and video!) 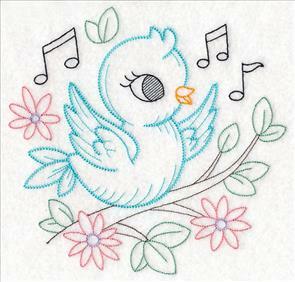 for embroidering on onesies here, and all our children and nursery projects here. 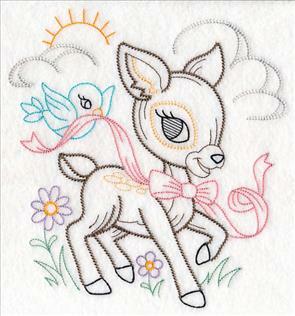 Seven designs featuring the cute-as-a-button critters (including a deer, raccoon, bird, fox, bear, squirrel, and bunny) will wow on wall hangings, pillows, baby blankets, and more. 7.76" x 7.56" and 6.65" x 6.48"
5.76" x 5.61" and 4.99" x 4.86"
7.71" x 7.51" and 6.32" x 6.16"
5.48" x 5.33" and 4.98" x 4.85"
Change the colors of the flowers, birds, and butterflies in these designs to match the decorating scheme for your little one's bedroom. 8.67" x 6.85" and 7.81" x 6.17"
7.41" x 5.85" and 5.88" x 4.65"
7.81" x 6.79" and 7.09" x 6.17"
5.86" x 5.09" and 5.33" x 4.63"
Finish off this collection of precious pals with a too-cute bunny rabbit! Great for kids' apparel, days-of-the-week towel sets, and more. 6.19" x 7.80" and 5.51" x 6.96" and 5.01" x 6.33" and 4.55" x 5.75" and 3.06" x 3.89"
Adorn a set of tea towels or a baby quilt with this group of playful animals. Get them all now in a design pack -- priced at only $12.97! 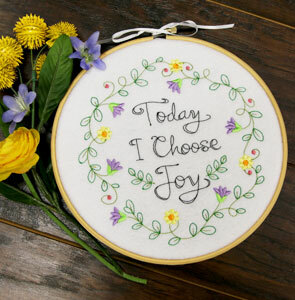 Stitch words of inspiration on pillows, totes, quilt blocks, and more with vintage-style wreaths. 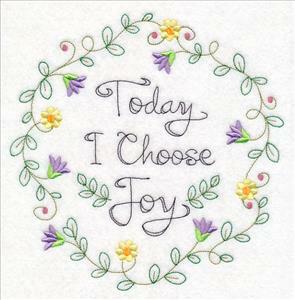 Phrases like "Be Happy," "Let Your Light Shine," and "Today I Choose Joy" will brighten up any room. 7.79" x 7.80" and 6.85" x 6.86"
7.80" x 7.70" and 6.94" x 6.85"
Light greenery and pretty flowers are featured in each wreath -- change the colors to match your home decor! 7.73" x 7.80" and 6.80" x 6.86"
5.86" x 5.91" and 4.85" x 4.89"
A hand embroidery hoop adds a crafty look to this delightful wreath. 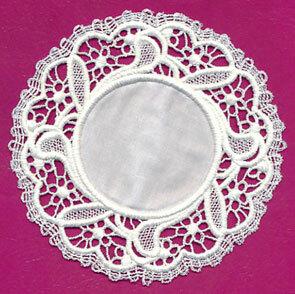 Gorgeous lace doilies add a graceful look to any room in the home! Use them to accent a side table in your living room, or as classic coasters in your kitchen. 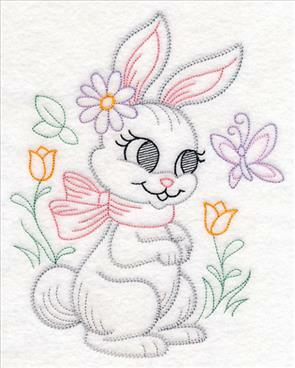 Stitch in white for a traditional look, or add colored and patterned fabric to fit your personal style. 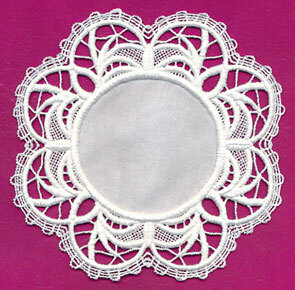 Each of the doilies feature different details -- stitch them all! 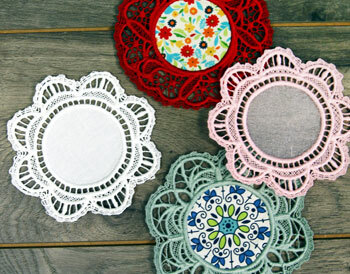 See how to stitch and assemble these doilies in this project tutorial. 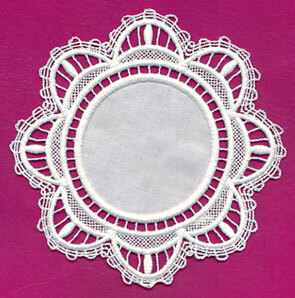 5.84" x 5.85" and 4.81" x 4.81"
5.86" x 5.86" and 4.88" x 4.88" and 3.88" x 3.88"
Miniature lace designs are lovely additions to charm bracelets, keychains, necklaces, earrings, and so much more! 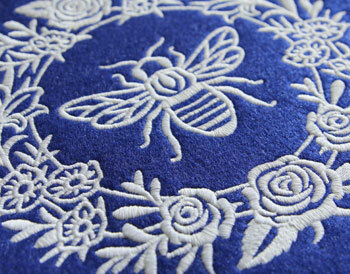 Ranging in motifs including sewing notions, garden elements, and more, there's something for everyone. 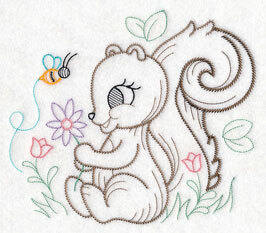 Get our best tips and tricks for embroidering these designs right here. 1.78" x 1.62" and 1.17" x 1.12"
1.74" x 2.03" and 1.16" x 1.36"
1.92" x 1.61" and 1.26" x 1.08"
1.35" x 1.88" and 0.89" x 1.26"
Bring vintage charm to your embroidery with these miniature lace designs. Get all twelve now in a design pack -- priced at only $19.97! 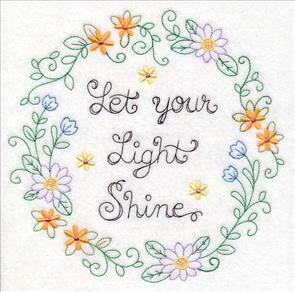 Lg - Designs smaller than 4" x 4"
Fill your home with hope thanks to this fabulous design. Floral details and bright colors add beautiful style to any project -- find more designs like this here! 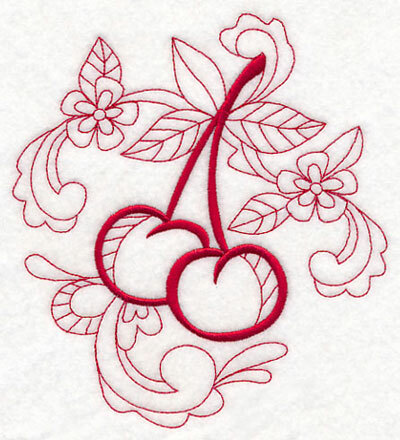 9.11" x 4.24" and 7.26" x 3.38" and 6.01" x 2.80" and 5.26" x 2.45"
Kari loves the doodle designs, and requested a pair of sweet cherries to add to her kitchen. See them featured on the Kitchen Clean-Up Caddy project in this week's new video! 5.84" x 6.42" and 4.84" x 5.32" and 3.49" x 3.85" and 2.73" x 3.00"